There is a new theme up at Paper Issues - Picnics and Patriots. You don't have to use red, white and blue, but there are some gorgeous projects using the kit Cassie put together from Pink Paislee. If you have been around here while, you know by know, the 4th of July is kind-of-a-big-deal in my family. We have some serious traditions surrounding this day, and it's something we look forward to every year. I really loved this line from Pink Paislee, such fun designs, and I love that there are two colors of blue. 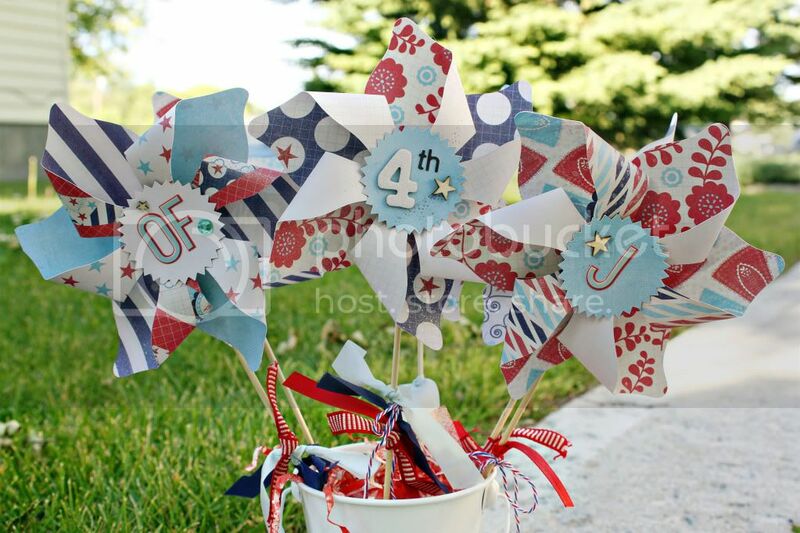 I chose to make some pinwheels to use as table decorations for our big BBQ on the 4th of July. Supplies: Pink Paislee Kit, October Afternoon Letters, Studio Calico Veneer Starts, American Crafts Numbers Thickers, Basic Grey Mini Mono Letters, October Afternoon Ribbon, My Mind's Eye Jewels, Divine Twine Airmail Twine, Studio Calico Mr. Huey Shine.. I used a six-petal pinwheel shape and pinked edge circle ( I used the yellow one) from the Silhouette Store. 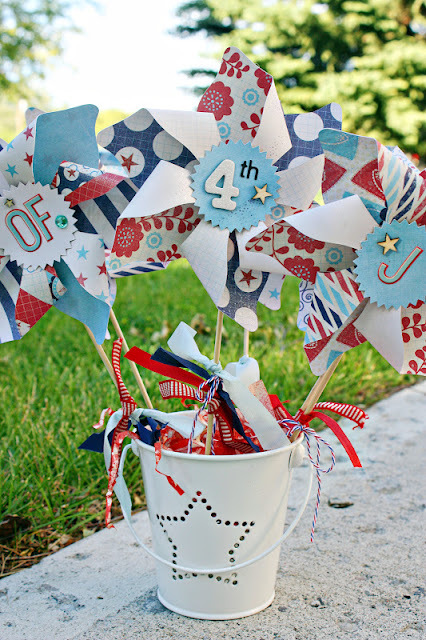 I used brads to hold the pinwheels together, and then hot-glued them to the skewers. I added the pinked circles with some pop dots and then decorated with some jewels, stars, letters/numbers, and ribbons. I added some crinkled paper (which I misted) and some rice to hold the skewers. just to give them a slight shimmer. I really love the way these turned out. I had the image in my head and they surpassed it. I'm excited to bring these to our BBQ. Now head over to Paper Issues and link up our projects for a chance to win this kit from Cassie.